Love cooking with gas? Then you'll love this range. This review was published on October 31, 2014. Since then, this product may have been discontinued or replaced. Pricing and availability may differ from what is stated in the review. The results speak for themselves, and the Frigidaire FGGF3054MF (MSRP $1,149) gas freestanding range is one of the best we've ever tested. The range combines dashing good looks, even simmering temperatures, blistering boiling and preheating speeds, and total baking uniformity. It's also got much-appreciated features, like true convection, a two-hour self-clean, and a temperature probe. Even better: You can find it on sale for under $900. It might not look as fancy as ranges that cost three times as much, but the FGGF3054MF is one potent—and well-priced—package. At this price, we expected Frigidare to skimp on at least a couple of features. Imagine our surprise to find the FGGF3054MF absolutely stuffed with bells and whistles, all of which should go a long toward making your cooking experience more pleasurable. On the outside, the FGGF3054MF is finished in a smudge-proof stainless steel skin. It works as intended—the trim is definitely more resistant to grime and fingerprints than competing ovens—but it's also a little darker than most other stainless appliances. The FGGF3054MF also features a 2-hour self cleaning cycle, though there's no option for steam cleaning. Along with the welcome cleaning advances, the FGGF3054MF also has a bevy of cooking features. The central 10,000 BTU "fish burner" is great for cooking long items. The oven is equipped with a temperature probe, so you can keep an eye on your food without actually opening up the cavity. 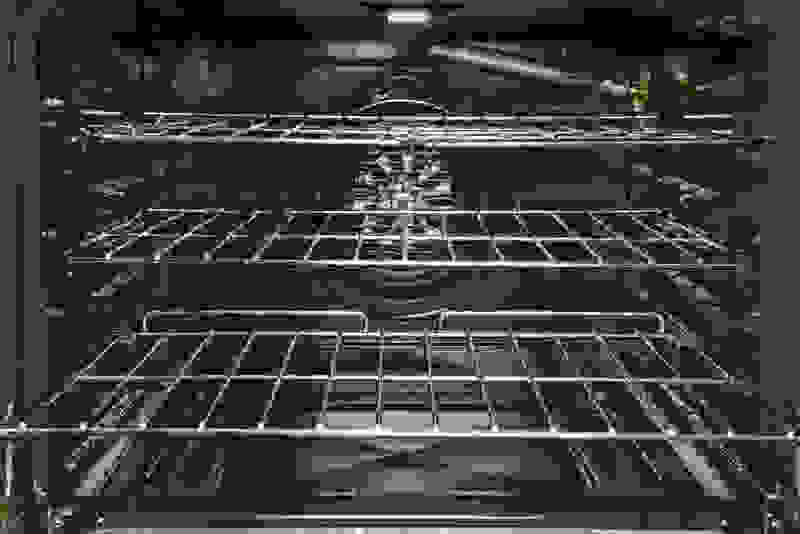 A sliding oven rack makes taking heavy dishes out of the oven a little easier—just be aware that sliding racks add a few minutes to preheat times. Fortunately, the FGGF3054MF does have a quick preheat setting to offset any delays. Another useful feature is what Frigidaire calls the Spacewise rack. This clever half rack lets you store an additional dish on one side of the oven while maintaining clearance room for tall items. 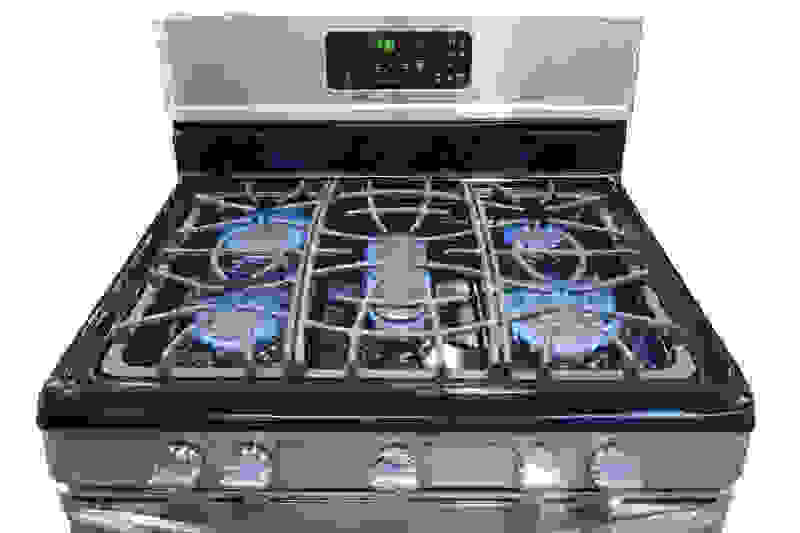 We were impressed with the FGGF3054MF's gas rangetop. While gas burners are extremely responsive, they typically lack the raw power and speed of their electric and induction counterparts. In the crucial areas of water boiling speed and minimum temperatures, the FGGF3054MF held its own. The front right burner brought six cups of water to the boil in just four minutes, which is impressive for gas. The rear left burner managed to boil the same amount of water in six minutes, too. That's good news if you plan on boiling two pots at once. We also recorded some amazingly low minimum temperatures. The rear left burner got as low as 123°F, while the overall average across all four was a cool 122°F. That's good news if you're making sauce or soup. A great set of burners is one thing, but a mediocre oven can really take the shine off a range. Fortunately, the FGGF3054MF's oven is a perfect companion to the rangetop, and features a fast preheat speed and some excellent cooking performance. The oven cavity took only seven minutes to reach 350°F, and that's without the Quick Preheat setting. That's so fast, you might not have time to prep your food, so take that into account if you plan on roasting up some vegetables. When it comes to the FGGF3054MF's overall baking evenness and uniformity, the proof is in the pudding, or... in the cookies and cakes, we should say. The standard bake setting—without convection—resulted in almost perfectly uniform cookies. We had to squint just to see any difference between them at all—luckily, our photospectrometer proved our eyes weren't deceiving us. The bottoms of the cookies were slightly overdone, but this can be avoided if you use a lightly colored baking sheet. The cakes, while less impressive, were also in great shape. Baking with convection resulted in less impressive cookies (this isn't uncommon for dishes that don't take long to bake) but improved the overall cake uniformity considerably. Our advice: Stick with the standard bake setting for dishes that require a short cooking time. 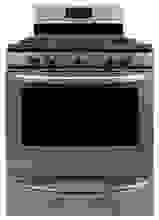 If you're looking for a gas range with great performance, the Frigidaire FGGF3054MF should be on your shopping list. Best of all, it can be found for under $900 on sale. A low price doesn't mean a budget product, though. This Frigidaire features such extras as a roll-out rack, continuous grates, a temperature probe, five burners, and true convection. Stainless trim and front-mounted controls keep it stylish. If gas is your fuel of choice, this range is worth checking out.